Hauskaa lauantaita, tänään matkataan juhlimaan merenrannalle Kotkaan. Tervetuloa viikon Allsorts haasteen pariin! Halloweeni aikaa vietetään ja värihaasteesta voi valita kaksi tai kaikki värit: musta, violetti, oranssi! Mallikortistani jätin pois oranssin. Hi; Happy Saturday, it's time for a new Allsorts Challenge! We have a colour theme, pick two or use all three: black, purple and orange! Our sponsors are Lets Create & Jessica Lynne. 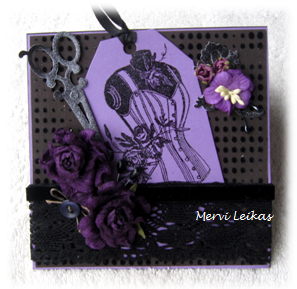 Stampendous image stamped on a purple tag ( Sizzix) with Versafine black and embossed with clear powder. Black velvet background is a piece of tapestry. 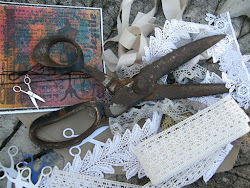 Black lace and velvet ribbon, purple big roses, button, flowers and Sizzix die cuts. As you see it's hard to take good photos from such a dark card. Lovely bold colours Mervi and great take on the colour theme. Ihana väri maailma ja kokonaisuua. Pitäsi isenikin kokeilla tuota leimasinta! The purple and black is so stunning, great depth of colour, fabulous card. Gosh, what a beauty!! 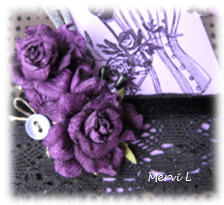 Very dramatic and feminine with the purple and black combo, love the cluster of flowers and the scissors, gorgeous! Fabulous creation, I love the image and design.